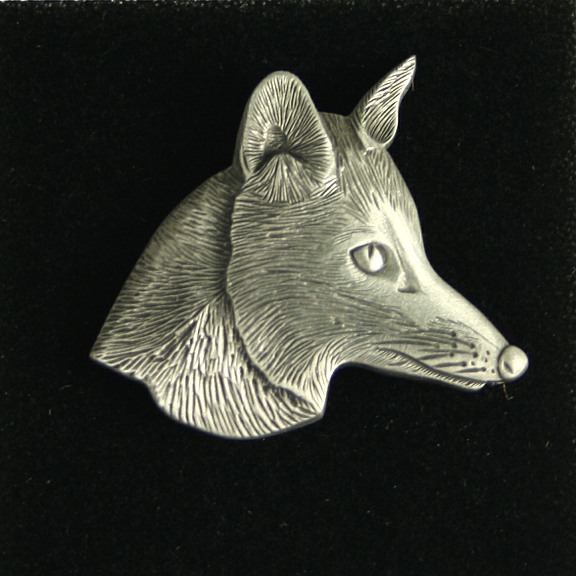 A large pewter unisex fox brooch depicting a beautiful foxes head with lots of detail. Brooch bar fitting with security clasp. Boxed. One of our Costume Jewellery Brooches collection. An attractive ladies fox scarf with foxes design on a plain navy blue background. Green Fox Tie. A beautiful foxes head on an olive green tie made from a combination of silk and wool. The fox tie motif is stitched not printed and contains plenty of detail. A cream cravat with fox motif in a repeat pattern made from beautiful cool and soft cotton lawn.